Lucrosa is one of the latest binary options trading systems we’ve encountered. Most people in the binary options industry have probably received an email asking them to sign-up to use the system. However, we’d ask you to wait and read this review before deciding. We have investigated Lucrosa and have a couple of straight facts to reveal which should be factored into your decision. The online trading industry is flooded with hundreds if not thousands of fake software, system, and bots promising traders millions in profits. The vast majority of these are scams which is why it’s worth taking a very close look at Lucrosa. Our review is thorough, and at the end, we’ll also tell you if it’s worth your time and money! We were not surprised when watching Lucrosa’s video which followed the same format of just about any other shady video we’ve watched. The video loads as soon as the website does and so you don’t have any other option other than watching it. The video starts with a man calling himself John Lucrosa saying something like would you like to make $7000 a day? The introductory video makes some outlandish claims which start out with the promise of being able to make over $7000 a day. However, in reality, that’s not possible in the Binary Options trading industry with just an investment of $250. Though like all other scams the bogus claims go on and become even more outrageous. The person claiming to be John Lucrosa then says that he will pay anyone watching the video $600, and then each member will make an additional $600 for every hour they work. All of this amounts to millions a year if not more. Though there is a contradiction between what he had originally stated that people would make $7000 a day and then later says that the amount is $1400, so which is it? Moving forward to keep people hooked on to the video he says that a couple of secrets will be revealed in the video. The secrets have as he claims are hidden by individuals who know how to make money online. He then says that people will witness his software working in real time. Later Mr. Lucrosa makes a couple of more fake promises but forgets to talk about how the software works which to us is the most important aspect of it and something of interest to genuine traders. The video continues with more lies and goes overboard by saying that people who join the same day will get $7051 in their accounts the next day. Of course, this is just another cheap method used by scammers to lure people. 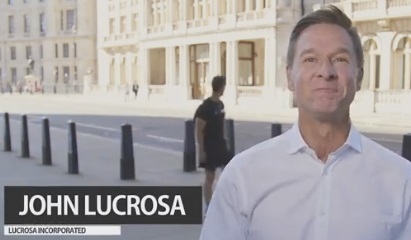 To start off, we’d strongly advise that you don’t waste your time watching this 25 minutes long promotional video mainly because you’ll not receive the $600 that Lucrosa has promised. Plus, after having watched the video in its entirety, we can safely say that there is no live demo of the software in action. The video is only comprised of paid actors who just appear out of nowhere and say their cheesy lines. Yes, we know that it’s hard to believe, but just about everyone in the video is a cheap actor. Dozens of false claims are thrown at you, with photoshopped screenshots that morph into the frame. Now that we’ve established that the promotional video is rubbish its time to move on to discussing why it’s a scam with proof. So Why is Lucrosa Software Just Another Trading Scam? Like every other scam trading software we have reviewed over the years the official Lucrosa website is no different. It has all the basic elements you’d expect but misses out on some significant details like product information, account types, customer support, phone numbers and the list goes on. Plus, there is no mention of how the system exactly works. So, that remains a mystery to this day, and perhaps we’ll never find out. Is this John Lucrosa Character a real person? Can he be trusted? The claim made by this con artists is that he is used to be a manager at some top end hedge fund. He claims to be one of the top trading experts in the industry, but we’ve not heard anything from him in over five years. So, decided to do some research to find out more about who this person is but were not able to find anything. Not being able to find information about a well-known trader who everyone loves and respects is kind of fishy. A top end, a successful trader with an immense fortune, should have been featured on Forbes or some other popular financial magazines, but we found nothing. Based on not being able to find anything we conclude that John Lucrosa is a fictitious character and probably a paid actor. Is Lucrosa Inc a Registered business? We did some research to find out more about Lucrosa Inc and yes we were surprised that it exists! The company is based in the US though it’s not owned by John Lucrosa. We suspect that they probably just used the company name randomly so that people think its legit. Plus, that was to be expected since there is no information about John Lucrosa or anyone who appears in the promo video. The glowing testimonials are located at the bottom of the scam website. The testimonials appear to be written by individuals who have no idea about trading binary options, but it still appears legit to the untrained eye. Though they are all fake, take for instance of Alice Smithers one of the people who has left a testimonial on the website. A reverse image search will reveal that the same picture has been used across dozens of other scam trading sites like Cloud Trader, Profit Maker Method, etc. How Did They Manage To Get So Many Users In Just A Month? Lucrosa software is a scam, and there are many reasons why we have called it out. The claim made by John Lucrosa is that the system has been live and profitable for many years. But when we checked the domain registration date for lucrosa.co, we found that it was registered just a month back. Most certainly not! The entire claim of being able to make $7000 daily with just a $250 investment and on autopilot is a stretch of anyone’s imagination. Even the best traders, trading manually cannot achieve this type of profitability so how is it possible with a trading bot running on autopilot. Our recommendation is to steer clear from Lucrosa and probably spend the money on a genuine trading software. 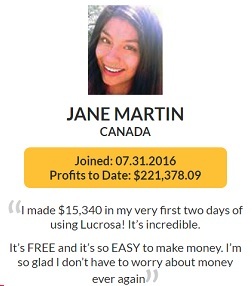 We have after a thorough investigation concluded that in fact the Lucrosa software in a huge binary options scam. The lame offers on the half-baked website and no details as to how the system actually works all points to it being a scam. We advise anyone and everyone reading this review to stay away from the scam because these fraudsters are out to take your money and run. You’ll not earn a single dollar that’s our guarantee based on the proof provided above.